Powder Brush and the perfect Creme Concealer. Our Face Powders create a light, silky veil which can be used on bare skin or as a setting powder over makeup for a flawless finish that lasts all day. Oil-absorbing ingredients minimize shine for a long-lasting, clean matte finish while providing sheer, breathable coverage. Available Loose or in our purse-sized Pressed Mini with mirror. 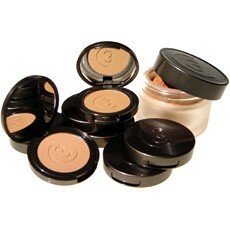 Coming soon - our Face Powders will also be available in refills for your Refillable Trio Compact! Translucent Loose Powder - This exclusive powder is ultra-light, matte and extraordinarily sheer. It applies perfectly on bare skin or over makeup creating a natural radiance while providing a smooth, lasting finish.